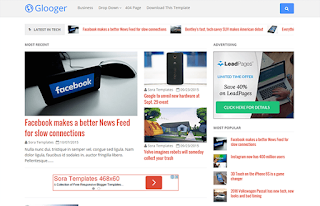 Glooger is an all purpose blogger theme designed for online magazine, technology blog, food recipe blog, or news and editorial ventures. Glooger has a responsive layout and a unique modern design. The layout will adapt to different screen sizes which will make your website compatible with any devices such as smartphones, tablets, laptop or desktop computers. Built with latest coding standards and clean design, the theme is envisioned to provide you a free blogger templates for long-term and it will help you to get a powerful solution for online projects.